7.51 points at 43 votes (rank 205). Donald appears in the at that time still young computer world in 1984, with one of the best early edutainment games designed by Al Lowe (Larry) for Sierra and based on Disney characters. A small anecdote for a start (from duckipedia.de): "Over a decade you could only buy this game When Al Lowe founded his page (1998), he asked his friends at Disney if he can offer this one and other games as freeware. According to Al Lowe, they agreed without batting an eye. . ."
At first glance this game is only a collection of arcade oriented mini games for kids. The plot is simple: You as Donald Duck have various workplaces to choose from to earn money which you need to buy items for the playground of your nephews. On the second glance, however, the game teaches many small lessons. Donald looks left and right before crossing the rails, the cash desk either wants the exact money (faster and easier) or you need to take out the change correctly, the payment follows an order, etc. The game (unfortunately?) has no real ending or goal and also no highscore list or points. Simple but lovingly designed graphics with fluent, partially funny animations (look at Donald's clamour, when he drops a vegetable at the market). Appropriate FX (airplane landing, train that drives past the toy shop etc. ), the background music can become tedious after some time though. The program is a mixture of educational software (paying and giving change at the cash desk in shops) and arcade game (mini games at Donald’s workplaces). At the beginning you can choose a “difficulty level” (joystick forwards/backwards, fire to confirm). In "intermediate" and "advanced" level the games will run a bit faster, in exchange you will get more money. After a working shift you get paid your salary. You can spend this hard-earned money now in the Hardware Store, the Junk Shop, or the 5 & 10 by buying parts for your playground. The equipment is now delivered to the park where you can design the playground as desired. Here Donald needs to throw the suitcases, that are labelled with a destination shortage (IATA-Code), into the transport wagon with the same shortage going to the airplane. If he gets hold of a suitcase that doesn’t fit the shortages, he needs to place it back to a free place on the conveyor belt. That’s it. This is one of the easiest games. Donald needs to catch the fruits that are thrown out of the truck and then sort them in according to the drawings on the boxes. If he takes the wrong box, there will be sludge. 1.) Look for the "twin" of the toy that you need to sort in. 2.) Place the ladder to the left of this twin. 3. )Pick up the toy that needs to be sorted in and place it on the position of the twin. When the train comes (display of the rest time in the lower middle), the shelf needs to be closed with the level on the right side. Donald needs to pick up the goods from the delivery station with the help of a train to the destiny station. For this you can position the switch with the levers. The belonging of the levers and switches can be seen through the corresponding number. The next delivery / destiny station will be shown in the wagons at the lower edge of the screen. The "5 & 10" is a shop where you can buy many different things as slides, rings, trampolines, wooden horses, etc. The name comes from a time when the most things only cost a nickel or a dime. Here you find ladders, climbing beams and other things. This shop is sort of the "old-things-shop". Here you can find old tires, boxes, wheels, nets, etc. A paradise for children with fantasy. In the "beginner" or "intermediate" level only one, in the "advanced" level three goods per purchase can be bought. Donald's purse is in the lower half of the screen, the cash desk in the upper half. With the help of the cursor you give coins from Donald’s purse to the cash desk. Then press the T-button (TOTAL) on the cash register. If you have paid exactly, you will get a thank you and you can leave the shop with a press on the fire button. If you have paid too little, you will get a hint on the display of the cash register. If you have paid too much money, you will need to take the change from the cash drawer. After you have taken out the right amount you can leave the shop by pressing the fire button. Every piece of the bought equipment for the playground is automatically delivered and installed at a free place. A nephew of Donald is already at the playground to try out the new items. Use the joystick to move him around. Press on the fire button to let him try a toy. With the key F5 you get to the "construction mode". Here you can newly share out the different parts of the playground. To move a part it needs to be clicked with the cursor and then moved to a free place. To permanently remove a part, just move it to an existing one. To leave the construction mode press the key F5 once more. To get back to the main street, leave the playground with Donald’s nephew at the lower right side. On the playground there is space for 15 parts. If the playground is full and you buy a new part, it will be installed over a randomly chosen new one. 3.) luggage sorter at "McDUCK AIRLINES". 4.) good distributor at the "PRODUCE MARKET"
Cheats are not known for this game and don’t really make sense. Örg: "Good game, especially for kids." Sledgie: "Exactly, so it is good for all "C64-Retrofans" ;-) and it can be well used as economical simulation. All around it is graphically nicely designed. For our big ones there are also two more difficulty levels. For the small one it has its charm again and again. From me the game gets the full 10 points. " Guybrush: "After Pole Position my second game ever played and as a kid I thought it top, when I was about 11 years old it disappeared into the back area of my disk box, but in my beginner playing time it was THAT game for me. Therefore a clear 10!" TheKills "Oh dear, I almost had forgotten this game, but bow everything comes back! A top game, at least when I was 6, it was the hit. I have cluttered up the old playground and raked in money together with my sisters for hours. I only wonder why Donald still gets money when you e.g. sort in a water melon and let fall down the rest ;) "
Darkstar: "This game originally is a children’s game. You do not have to think much and the music and graphics are made well. Even though I was a bit too old at that time (and I was never really a real Disney fan) it was quite fun. Yes, this brings back memories… *g*"
Bamse: "Donald goes to work to build a playground for his nephews – is there a better reason to play a game? Not hardly! What adds to it are the toddle animation and the possibility to try out the playground yourself – all this makes a great game." At the start of the game you need to wait until the title melody is finished (it cannot be interrupted). 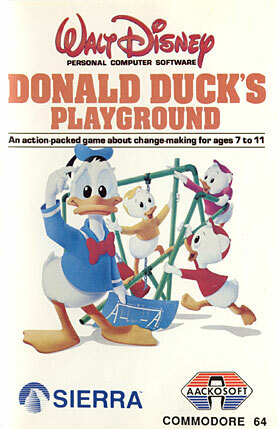 Donald Duck's Playground was awarded as best educational game of the year by several game magazines. At least the versions for Amiga, Atari ST and IBM and compatibles use Sierra's Adventure Game Interpreter (AGI) engine, which debuted in the original 1984 release of King's Quest. The original C64 version does not and reportedly Al Lowe "had mentioned how certain aspects of doing the AGI port were pretty ridiculous because of the way the AGI engine handled certain things, the cash register sequence being a prime example". This page was last modified on 31 December 2016, at 00:24.